Josep Jufré announced his retirement today at the age of 36, with the Astana mountain domestique unable to land a new contract on a ProTour team for this season. The Spaniard had not experienced a lull in number of racing days in recent years, so the announcement by Jufré may have been a bit unexpected. But with the closure of several teams including HTC Highroad and Geox-TMC, the free agent market became a bit saturated. Yet while he had to hang up the bike, Jufré was upbeat in a letter he addressed to cycling media and fans. “It is true I still had desire, strength, and hope to continue as a professional, but cycling can have difficult times, and I could not find a sufficiently attractive offer to continue. Hence my decision to retire and make way for younger riders,” he said. Jufré spent six years in the ProTour, riding with Cadel Evans on the Belgian Lotto squads in 2006 and 2007, and most recently with Astana in 2010 and 2011. 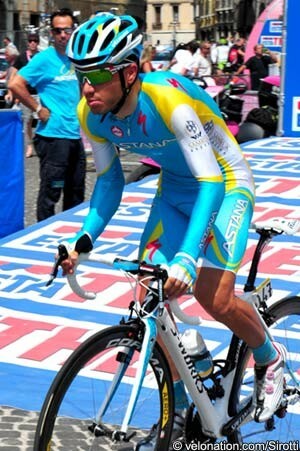 In both of those seasons with Astana, the Spanish domestique finished both the Giro d’Italia and the Vuelta a España. While his last win came in a team time trial in the Settimana Coppi e Bartali, raced with Evans and Johan Van Summeren on Predictor-Lotto in 2007, Jufré made a home at the Vuelta, finishing 23rd overall in 2010 after pacing home team leader Roman Kreuziger on the notorious Bola del Mundo queen stage of that edition. A true domestique, Jufré paid tribute to the leaders for whom he rode. Jufré rode for Saunier-Duval and its spin-offs in 2008 and 2009, and though he was on the Tour de France team caught up in the positive drug tests of Ricardo Ricco and Leonardo Piepoli in 2008, this experience had not tarnished his perspective of his sport. “My favourite hobby has become my way of life, I’ve been to wonderful places throughout the world that I could hardly have been able to access otherwise, I learned French, English, and Portuguese after many years of cohabitation with colleagues on highways and in hotels, and I felt the magic of being able to participate in the Vuelta a España, the Giro d’Italia, and the Tour de France. These experiences make me feel very lucky, and all my thanks.